Aromatic microspheres have a wide range of applications due to their superior stability and slow release period. Specially, aromatic microspheres are of regular spherical structures with a uniform particle size distribution, most of which is between 40 and 100 μm. After the aromatic microspheres were inked, the screen printing technology was used to transfer ink to the substrates, such as coated paper, cardboard, non-woven fabrics and cotton cloth. In this study, aromatic microspheres were prepared by in situ polymerization with citral as core materials and melamine-formaldehyde resin (MF) as shell material. Meanwhile, the surface morphology, particle size and heat resistance of aromatic microspheres were investigated in detail. The morphology and adhesive property of aromatic ink were tested and more types of substrates can be used after the ink is formed. The finally obtained aromatic microspheres have a compact surface and a uniform particle size distribution and can maintain a complete structure at a temperature of 317 °C or lower. 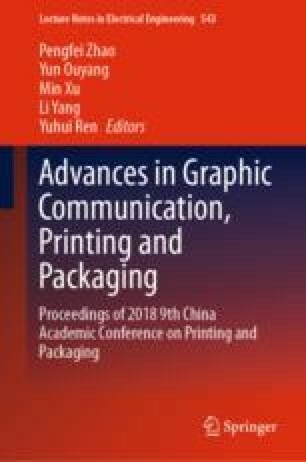 This work was supported by the National Natural Science Foundation of China (21776021, 21646013), BIGC Key Project (Ea 201701, Ec201801), 2011 collaborative Innovation Center of Green Printing & Publishing Technology (No. 04190118003/002) and the Cross training Plan for High Level Talents in Beijing.